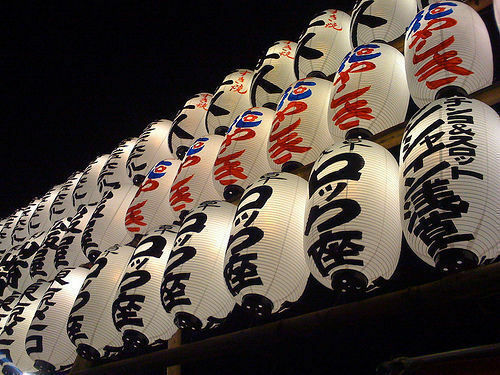 If I had one day to spend in Tokyo, I probably would choose to spend it in Asakusa. The Senso-ji Buddhist temple and surrounding labyrinth of shops is a popular tourist destination for Japanese and International visitors alike, and on weekdays you’ll find throngs of school children on class trips who might ask you to help them complete an assignment. I was delighted when I was approached by the first trio, two little girls and a boy of elementary school age, clutching a large piece of paper with a map of the world and a list in Japanese. They each introduced themselves and then the middle girl took the lead as spokesperson, reading off questions and filling in the blanks with my answers. How are you? Where are you from? Are you enjoying your visit? Do you like Japanese food? At the end they presented me with a present, a slightly crumpled origami fortune teller, what I knew as “cootie catchers” when I was their age. While the experience left me grinning like a fool afterwards, I must admit that after the third interview I found myself avoiding the trios of school children that filled Nakamise-dori, the main corridor of shops (although the origami gifts are something that I’ll cherish always). I’d read about the shopping district of Asakusa, but I hadn’t been prepared for rows and rows of shops, parallel and perpendicular to each other in a disorientation grid of colors and sounds and smells, paper lanterns and plastic sakura branches, kimono shops next to yakitori stands, craft stores spilling onto the street, designer bags and watches sharing space with sake cups and Hello Kitty dolls. Although “never buy the first thing you see” is a good lesson when shopping in markets, as there’s a likeliness of finding the same thing for cheaper the next stall over, I quickly realized that the maze of shops was such that I might never find what I was looking for again, and indeed I ended up running back to a booth where I’d pondered for several minutes over a pair of pocket watches (I’m something of a collector). Although later in my trip I would find myself miserable from the cold, that first day spent wandering the shops was beautifully warm and sunny, and at one point I stopped at an ice cream shop that had an amazing array of unusual ice cream flavors, from rose to tofu. I purchased a plum flavored ice cream (deliciously sweet and slightly tart), and at the shop owner’s instructions joined the small cluster of girls eating their ice creams on one side of the tiny shop (eating while walking isn’t really done is Japan). If you take a left at the main entrance to the Senso-ji temple, on the corner of the next intersection, covered in vines, is the Asakusa Kannon Onsen. There aren’t any signage to signify it as such, and if I hadn’t seen a photo online beforehand, I probably wouldn’t have recognized it. The man behind the counter recognized me as a clueless tourist as soon as I entered, and was very kind about asking if I needed to rent a towel, showing me where to place my shoes, and leading me to the women’s changing area. The changing area itself was a large open room with lockers along the walls and a sliding door to the bath. Unsure of myself, unsure of what to do and too hesitant to ask for help from the single fully clothed woman who sat at a table applying makeup, I stood uncertainly in the middle of the room for a few minutes before mustering up the courage to disrobe. Standing naked in front of perfect strangers isn’t nearly as awkward as I thought it would be. Nobody cares. Nobody cares that you’re naked, nobody cares that you’re pudgy, nobody cares that you’re obviously foreign. You’re all there for the same reason– to take a bath. Shoving my clothes into the locker, I draped my towel over my arm and crept over to the glass door, gazing into the steamy bath area. There was an older woman in there, sitting on a stool and bathing herself with one of a dozen hand-held showers arranged along the tiled walls. I must have still seemed hesitant, because the woman at the table took pity on me and slid open the door (assuming, perhaps, that I couldn’t figure out how to get in– and I confess, my entire time in Japan I had an embarassing tendency to push or pull on sliding glass doors, making them rattle on their tracks instead of the expected swing back or forward). I hadn’t thought to bring soap or shampoo with me, and I wasn’t about to try asking to borrow from someone else. I can barely ask favors from my friends when I’m fully clothed and we speak the same language. Grabbing a stool and a bucket from the stack by the wall, I chose a faucet situated behind a cement support column so that the old woman couldn’t scold me for doing it wrong, and yet I could still sneak glimpses of her to try to figure out how to do things properly. The key is to wash first, and thoroughly, before going in the main bath. Also, don’t let your towel or hair get into the water. The other woman did several rounds of showering then bathing, but I chose to go into the bath only once before bailing out. I don’t know if my comfort level would have been higher or lower had I been with friends (perhaps if it were a friend I was extremely comfortable with) but at the time I thought the entire experience was a bit overrated. Now that I’ve had some time to reflect, I’ll glad I made the effort, and I would probably do it again. Toweling myself off in the changing room once again, with the same woman still dutifully beautifying herself at the table, I saw another obvious tourist come in. The woman at the table, ever patient, silently demonstrated how to use the lockers. I could have told her what to do, but I hung back. Learning is part of the experience.